Ever wonder where it goes? A flush down the toilet isn't the end of the line. When you flush the water and unmentionables they go somewhere. Where does it go after we flush the toilet, empty the sink, or take a shower and how does it safely find its way back to the environment? Drain lines or laterals from homes, businesses, industries, and institutional facilities are connected to a larger sewer pipe system that conveys flushed and drained wastewater to a treatment facility prior to being released safely into the environment. Some things should never be flushed or sent down the drain because they cause problems with the sewer lines or treatment facility. For general information from the Water Environment Federation (WEF) on how to dispose of a wide range of household products, please click here. Trash and Non-Dispersible items such as the examples listed below are a growing problem in wastewater systems due to increasing use by consumers. When the wrong thing is flushed, results can include costly backups on your own property or problems in your local sewer system or at your wastewater treatment plant. That’s why it’s so important to treat toilets properly and flush only your personal contributions to the local wastewater treatment plant. Do not use your toilet as a trash can! Even products like baby wipes that are easy to flush and seem similar to products designed for flushing do not disintegrate in water like toilet paper and should not be flushed. As shown in the photo below, even after 24 hours of mixing, products such as baby wipes do not breakdown and can buildup and plug your sewer system. Tested at Orange County Sanitation District Lab, 2012. Source OCSD. Consumer products containing plastic microbeads are an emerging environmental issue and a growing problem in wastewater systems due to increasing use by consumers. Microplastic beads are small plastic particles usually less than 1 millimeter in size which are found in some brands of products such as facial cleansers, exfoliating cleansers, tooth paste, and abrasive cleaning products. When these products are used and sent down the drain, the beads end up at the wastewater plant. Some are removed by the treatment process, however, studies have shown that a significant number pass through and enter the lakes, streams and oceans where the treated effluent is discharged. The particles that are removed end up in the biosolids which are commonly applied to agricultural land as fertilizer where they may enter streams through runoff. Once in the natural environment, these small particles have the potential to persist for a many years, travel long distances, and be ingested by suspension-feeding organisms such as clams, mussels, worms and insects. These particles may also adsorb harmful hydrophobic organic contaminants like pesticides and transport them into organisms. Larger organisms such as fish and birds may then be harmed by consuming the plastic when feeding on the lower organisms. To help the water environment, please avoid purchasing and using products labeled to contain plastic microbeads. Fats, oils, and greases (FOG) aren't just bad for arteries and waistlines; they're bad for sewers too. The most common cause of sewer plugging and backups is caused by FOG. Grease and oil comes from cooking, meat fats, lard, oil, shortening, butter, margarine, sauces, and dairy products. If they are sent down the sink drain they stick to the surfaces of drain piping and sewers. 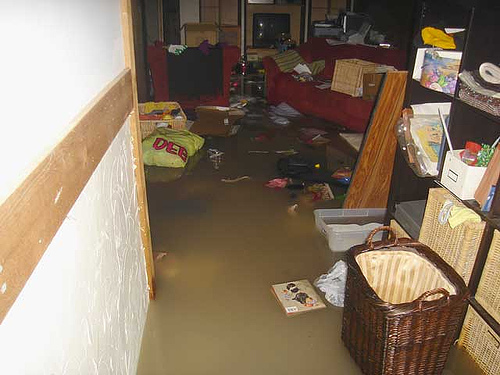 They can eventually build up to the point of full plugging and then raw sewage can backup into your home or overflow into the street. You can help prevent this most unpleasant situation. In-sink disposal units do not keep grease out of sewers. Hot water and detergents that dissolve grease do not prevent a problem, they just move the problem down the system. As soon as the hot water or detergent is diluted with cold water in the sewer, the fats and grease come out of solution and stick to the inside of the pipes. Every day the average adult uses nine personal care products that contain hundreds of unique chemical compounds that end up in our water. These include soap, shampoo, toothpaste, cosmetics, and medicines. These products end up in the sewer when we bathe, shower, and use the bathroom. Analysis has shown the presence of chemical compounds and drugs in streams and lakes. While there is no current evidence that these chemicals in trace amounts pose a risk to human health, scientists have found interference with aquatic organisms including feminization of male fish from trace amounts of hormones in some locations. It is, therefore, prudent to control what ends up in the sewer and downstream water environment.